note: this site contains much quality statistical / historical data. upper stage Centaur rocket with American-built RL10 engine burning LO2 & LH2 as fuel. first stage with Russian-built RD-180 engine burning kerosene & LO2 as fuel. first stage assist can be performed by a range of strap-on SRB boosters that are asynchronously mounted. First stage uses 9 Merlin 1D FT Engines, Second stage uses 1 Merlin 1D Vacuum Engine. The First stage steering for (a/de)scent steering is done using a) Merlin 1D Gimbaled engines, b) Nitrogen gas thrusters, c) grid fins. The Merlin 1D uses Liquid oxygen, kerosene (RP-1) and a gas generator and Turbopump; all engines have Throttle and Restart capability. BFR, Big F..alcon Rocket (planned). The Soyuz launch vehicle is also used at Europe’s Spaceport in French Guiana, here the Soyuz-2 version called Soyuz-ST is used! a heavy-class version could follow in 2024, still single core but extra stages, 7.8T to GEO. Data Matrix for different existing rockets (incl some planned rockets for reference). 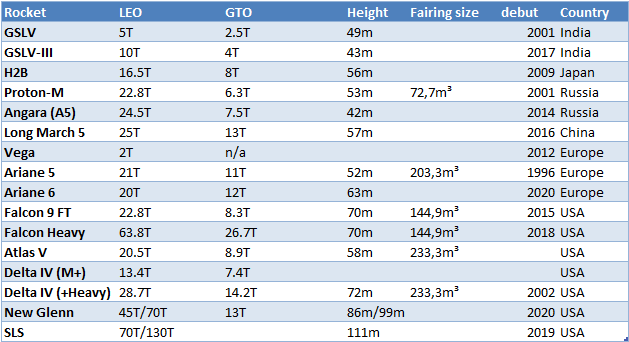 ULA Vulcan (first flight 2020, payload 15-23 to GTO is less then FH (FH has 26.7 to GTO))?! 62M$ - - - - 1B$ - 109M$ 400M$ 200M$ 90M$ ? ? 80M$ ? table notes: cost/launch are monetary values of 2016! Payload (to LEO) in metric tons. Derivative, Shenzhou: the design of Soyuz spacecraft was transferred (1995 deal) to China for the Shenzhou spacecraft. first mission 2008 for single use supply missions to ISS. No additional ATVs will be funded! first mission 2009 for single use supply missions to ISS. 2010 first flight, 2012 first cargo to ISS. This will remain an un-crewed cargo vehicle, crewed flights are planned for V2. 2013 first mission to dock with ISS, using Antares or Atlas V rocket. first flight planned 2018, delayed to 2019 or 2020. Capable of Propulsive landing by design, but decided to land exclusively by parachute in ocean on demand of NASA (the capsule will also not have landing legs as planned). August 2018 (Uncrewed), December 2018 (Planned). Blue Origin, New Shepard booster & crew capsule (sub-orbital?). ...and what would it take to achieve these goals - economically? HEO (High Earth Orbit), 35786Km. sometimes also Highly Elliptical Orbit. 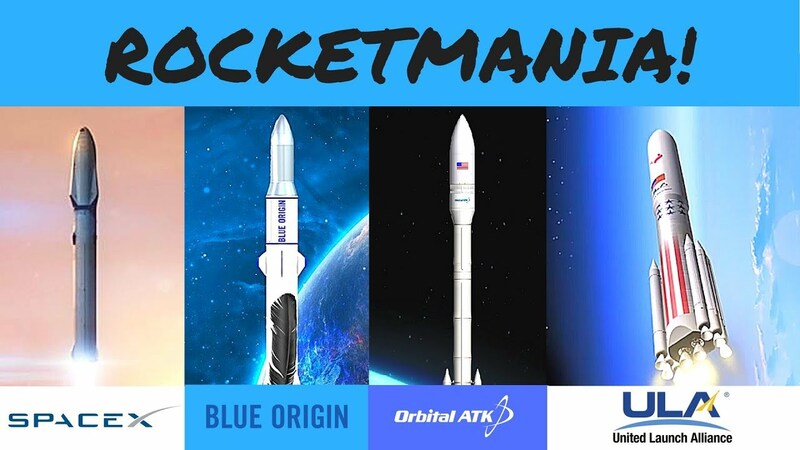 Planned engines (2018) SpaceX Raptor vs. Blue Origin BE-4 comparison. over-expanded nozzle may have the atmosphere pushing back into the nozzle and causes shock-diamonds at ground/lower-altitudes. another altitude compensating design to avoid this performance loss at lower altitudes are aero spikes. STS = Space Transportation System. reusable manned space vehicles beyond the Apollo Program, aka Space Shuttle Program. NRO = US government customer (National Reconnaissance Office) with usually top secret payloads. RP-1 = (Rocket Propellant-1 or Refined Petroleum-1) highly refined form of kerosene (similar to jet fuel, used specifically as rocket fuel). STP = Space Test Program provider for the US DoD; Payloads over time: http://space.skyrocket.de/doc_sat/stp.htm . note: also contains references to other years and future planned flights. ASOG = A Shortfall of Gravitas - homeport: Port Canaveral?? where are the spaceships and satellites going? Soyuz, Emergency rescue system history AND technology used today: french write-up G-translated.